4-port Programmable Waterproof / Dustproof Device Server with IP67 for Network Enabling Serial Devices. Has 2 RS-232 and 2 RS-485 ports and PoE. The PPDS-700-IP67 series is a family of Programmable Device Servers, also known as "Serial-to-Ethernet gateway", that are designed for linking RS-232/422/485 devices to an Ethernet network. The user-friendly VxComm Driver/Utility allows users to easily turn the built-in COM ports of the PPDS-700-IP67 series into standard COM ports on a PC. By virtue of its protocol independence, a small-core OS and high flexibility, the PPDS-700-IP67 series is able to meet the demands of every network-enabled application. The PPDS-700-IP67 series includes a powerful and reliable Xserver programming structure that allows you to design your robust Ethernet applications in one day. The built-in, high-performance MiniOS7 boots the PPDS-700-IP67 up in just one second and gives you fastest responses. The PPDS-700-IP67 is a special design for the toughest applications. It can be directly mounted to any machine or convenient flat surface. The rugged packaging and IP67 connectors are rated to protect against water, oil, dust, vibration, and much more. The PPDS-700-IP67 supports PoE (Power over Ethernet) function that allows power and data to be carried over a single Ethernet cable, so a device can operate solely from the power it receives through the data cable. This innovation allows greater flexibility in office design, higher efficiency in systems design, and faster turnaround time in set-up and implementation. When there is no PoE switch on site, the PPDS-700-IP67 accepts power input from a +12 VDC ~ +48 VDCadapter. 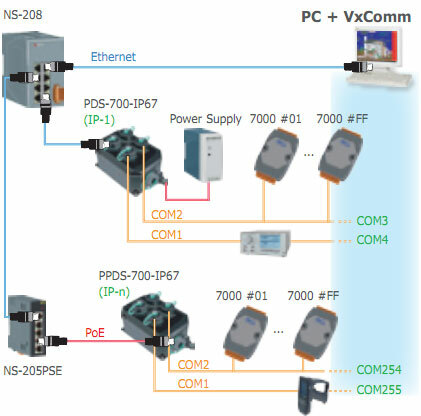 When using PoE devices such as the PPDS-700-MTCP, PPDS-700-IP67 and PET-7000 (Ethernet I/O module with PoE), you can select the ICP DAS "PoE" switch — "NS-205PSE" — as the power source. The NS-205PSE automatically detects whether the connected devices are PoE devices or not. This mechanism ensures that the NS-205PSE will work with both PoE and non-PoE devices simultaneously. As a power source for PoE devices, the NS-205PSE requires a power input ranging from +46 VDC ~ +55 VDC. 16 KB; Data retention: 40 years; 1,000,000 erase/write cycles.